In about three months or so, Google is expected to unveil its new phones, the rumored Google Pixel 3 and Pixel 3 XL. Leaked components of the phone have already revealed a big part of the secret around these phones: they will finally have a better design, with bigger screens and smaller bezels, and they will likely be better in every way. So with just several months until the launch, it really does not make much sense to go and buy the current Pixel 2 and Pixel 2 XL, and you're better off just waiting for the new gadgets. But before they come, we reminisce about the things that we really, really want to see fixed and improved in the new Pixel 3 series. This is our wish-list with the 5 things we wish Google changes in the Pixel 3. Our number one complaint with the Google Pixel 2 XL was certainly the low quality display. Just tilt the screen at a slight angle and it loses all sense of color, turning into a depressing shade of blue. Some Pixels also have a big problem with ghosting, an effect that leaves trails of things you have viewed on your screen permanently "ghosting" over what you are currently seeing. Our big wish for the Pixel 3 series is that Google really takes those issues seriously and brings a high-quality display panel to the new phones that will match their premium pricing and status. Let's face it: Google Pixel phones are not the most popular ones out there. Sure, the geeks and Android fans know about them, but they are just not that popular among the general public. There is a reason for that and it boils down to the very limited availability of Google Pixel phones. It's like Google doesn't even want to sell a Pixel phone to you! 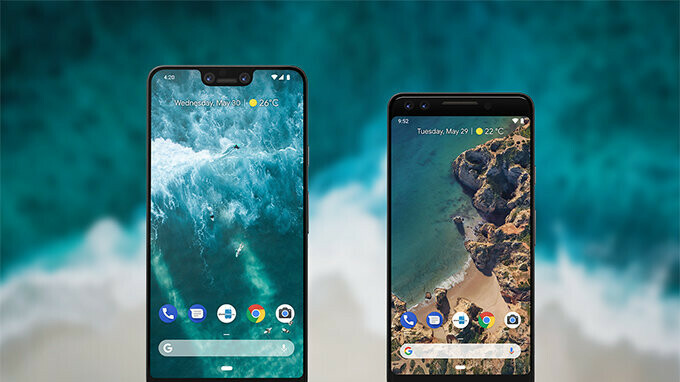 In the United States, Google has picked Verizon Wireless as the exclusive carrier for the Pixel 2 series, meaning that most people on the other carriers like AT&T, T-Mobile and Sprint simply cannot buy a Pixel easily. And worldwide the situation is even worse. The Google Pixel series are only officially sold in a handful of countries, while in many others the phones are just not available at all. The Pixel phones certainly have their character with the signature glass element around the camera and panda black-and-white Pixel 2 XL even got many people excited with its looks, but once you actually use a Pixel phone, it's hard to be too excited about its design. The phone actually has bigger side bezels than most flagship phones of the past few years and the top and bottom bezels still exist. The Pixel 2 XL is also bulky in a cumbersome way. It lacks any ergonomical design features: while other big phones like OnePlus have a curve on the back, the Pixel 2 XL features a flat back that makes it extremely hard to handle with a single hand. While the industry has moved to sleek glass designs and has perfected various aluminum finishes, the Pixel 2 XL features a surprisingly coarse back that almost feels unfinished. Yes, it is solid, cold metal, but it does not feel premium as you’d expect for a device with a hefty price like the Pixel. While both the Google Pixel 2 and Pixel 2 XL have dual front-firing speakers, the sound quality from these speakers is barely anything out of the ordinary. The sound just lacks the punch and richness that we saw is possible with newer phones like the iPhone 8/X series and the Samsung Galaxy S9 family. That's why we wish that Google upped its game with better quality loudspeakers in the Google Pixel 3 series. After all, Google has now gotten hold of a bunch of engineers from HTC, a company known to have brought a small revolution to smartphone speaker sound back in the day. Wireless charging has been around for years, but only recently it has really started to grow in popularity and we find ourselves more and more in love with the simplicity and convenience of wireless charging. Unfortunately, the Google Pixel 2/XL with their metal backs do not support wireless charging currently. We sincerely hope that this changes in the Pixel 3 series and Google brings this little convenience to its flagship phones. After all, even the Nexus 4 years ago supported wireless charging! Speaking of the Nexus, we are once again reminded of the past. The Nexus 4 and the Nexus 5 come to mind as two brilliant phones combining the speed and simplicity of pure Android and the affordable price of a Nexus. These days, OnePlus is the only company that fills the void from the Nexus program, but we really wish Google itself brought the Nexus idea back to life. We don't know whether this is possible: an affordable Android phone made by Google, maybe a smaller phone, a Pixel SE of sorts, but that is our secret wish for the future of Google phones. What would you like to see improved in the new Pixel 3 series of phones? And do you have a secret Google-phone dream? Don't hesitate to let us know in the comments below. I beg to differ. However since the Pixels mix glass and metal on the back. Google could make a metal phone with just a big enough glass window on the back to support wireless charging. That would be pretty cool. Plus I like the squeeze feature. Oh and I like Daydream. So as long as Google keeps that going, then I am on board. I cant believe that, no notch, isnt on the list. Meh, the display issues were resolved by January. Dragging that out time and again is just nonsense. I could care less about wireless charging, quick charge is awesome. I happen to like the design and prefer functionality over form anyways. #1 on the wish list: no bugs and more refined software/hardware at launch! I'm running Android P beta and I haven't experienced any bugs at all... though that wasn't the case when I first got the phone.... actually, when I first got it I was ready to return it because the phone crashed half the time I used the camera... that's no longer an issue though. Rename it Nexus. And then make it appealing. Hey Google I'm still waiting for the successor of Nexus 7 2013.
a Samsung built display is what I really want. wireless charging is the last thing on my list, as I dont like a glass back. Am I the only one here that wants to see a display higher than 1080p resolution? This is easily doable and believe this is a huge missing Factor when making this phone competitive to other Flagship models. I would say the screen quality and resolution is one of the most important things on a smartphone, since basically all you're doing is staring at whatever content you're using sharing watching or experiencing. I have the first Google pixel and also noticed the screen burn-in, which is terrible. I loved the Nexus 5 phone and the Nexus 7 tablet. I still use the Nexus tablet with LTE sometimes. They both had many great features. Wireless charging was one. They also supported Slimport micro USB to HDMI which let one hook to a larger screen. I'd add software that changes the resolution when using a larger screen so you can use it like a laptop. These features are missing on the latest pixel phones. I'd also add a removable battery. That's so much more important than a glass or aluminum back. Add a nice screen, FM radio, and fast charging and you've got a winner.